The visit began with driving into the Valet parking. No carts were available to help with luggage, etc. So in my daughter and I walked with suitcases, a cooler, pillows, clothes on hangers.....you get the picture. Check in was painless. The room was quite pleasant. The furniture modern; the chair uncomfortable, the couch very comfortable. The beds were WONDERFUL. Free bottles of water, coffee that was great. BUT, there was no in-house restaurant to get breakfast. Also, they tell you its a quick walk to the Amway Center.....lets just say it was a struggle for this senior citizen to make it. The Aloft is conveniently located to my office. I always like to stay there because I like their gym. It is better than a typical hotel gym with newer equipment and a full set of dumbbells. There is also a pool table and it's a fun casual atmosphere. The Aloft in downtown Orlando was a great hotel. Staff was very friendly, quick check-in and checkout, and they even upgraded our room for free. The guests, however, were not so great. They were loud and woke me up several times. It sounded like they were trying to have a party in their room.... while this doesn't mean the hotel itself had anything to do with this, next time I will ask for a room away from other guests! I stayed here with 4 friends for a reunion and we had a great stay. The staff were very friendly and accomodating and even bumped up our room for no charge. I would stay here again no questions asked. Great time with great people. Staff upgraded my room to a suite!! The air conditioner was controlled by Motion sensors. If there was no movement in the room, the air turned off. This is terrible because at night when you are sleeping, there is no motion in the room. The room was very hot and uncomfortable. Was coming to town for the UFC fights and wanted to stay close to the Amway Center. The hotel was a short walk to the arena, clean rooms and nice hotel bar downstairs. Would definitley stay there again. Hotel was a pleasant surprise. Brand new. Huge rooms. Staff was great! The staff was so friendly and helpful, from the front desk to the bar. They went above and beyond to make sure we had everything we needed. The location is perfect, walking distance to shops and restaurants. I also highly recommend the jalapeño margarita. It's my new favorite cocktail. Friendly staff, clean rooms and a unique history make this hotel a great find! I was there two days and one night. The entire staff was exceptionally helpful and attentive. My room was well laid out and organized. very convenient, short walking distance to all major downtown sites - food, events, etc. Will definitely opt to stay here again when I come back to Orlando. 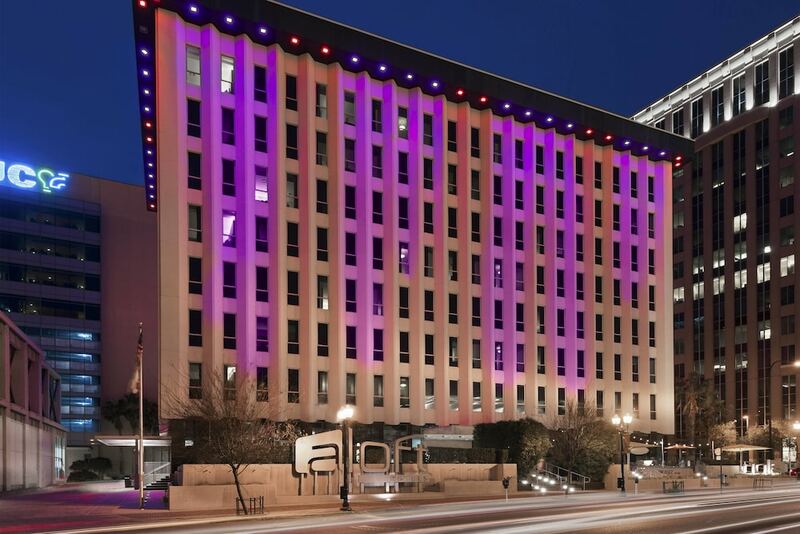 Located in Downtown Orlando, Aloft Orlando Downtown is adjacent to Dr. Phillips Center for the Performing Arts and within a 10-minute walk of other popular attractions like Church Street Station. This 118-room, 3-star hotel has an outdoor pool along with free in-room WiFi and a fitness center. Enjoy a leisurely bite to eat at the onsite restaurant, or have a drink at the bar/lounge. Start your day off with breakfast, available for a fee. A 42-inch LCD TV comes with cable channels, and guests can stay connected with free WiFi and wired Internet. The pillowtop bed provides a full night's sleep and the bathroom offers designer toiletries. Other standard amenities include a refrigerator and a coffee maker. Guests staying at Aloft Orlando Downtown enjoy an outdoor pool, a fitness center, and free WiFi in public areas. Valet parking is available for USD 25.00 per night, and there's also limo/town car service. A multilingual staff is on hand to assist with dry cleaning/laundry, securing valuables, and luggage storage. Additional amenities include conference space, a business center, and an ATM. W xyz(SM) bar - Bar. Recreation features at Aloft Orlando Downtown include an outdoor pool and a fitness center.